Classically asymptomatic (many insensate) and located pre-tibial or or medial malleolar areas. Associated with endocrinopathy, malignancy (particularly GI) and some drugs. Symmetrical hyperpigmented velvety plaques in the body folds. Association between AN, obesity, hypertension, ischaemic heart disease and type 2 diabetes. Type A is more common in young (particularly black) women with AN, primary amenorrhoea with hyper-testosteronaemia, virilisation, increased somatic growth, hyperglycaemia and hyperinsulinaemia with insulin resistance due to a congenital defect of insulin receptors. Type B consists of patients who are older with features suggesting other autoimmune diseases, including raised ESR, proteinuria, hypocomplementaemia with anti-nuclear and anti-DNA antibodies. 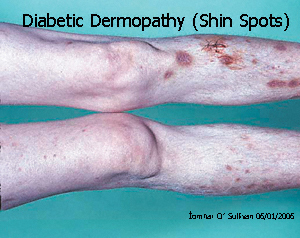 Fungal infections encountered in patients with diabetes include dermatophytes (tinea pedis, onychomycosis), candidiasis (mucosal and cutaneous) and mucormycosis with necrotising nasopharyngeal infections. Those at higher risk are patients with sensory neuropathy and peripheral vascular disease. Occur in up to 40% of people with diabetes. Evolve into crops of oval circumscribed, atrophic, slightly depressed, brownish lesions. 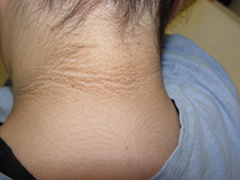 Spontaneously resolve, eventually healing with scar formation. Especially dorsum of the fingers. ‘Finger pebbles’ = multiple, tiny, flesh-coloured papules on the dorsum of the fingers, knuckle pads and periungual areas. back, neck and proximal extremities. 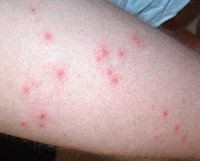 Widespread yellow to red papules. Poorly controlled DM who have massive hypertriglyceridemia. the buttocks, shoulders and extensor surfaces of extremities. 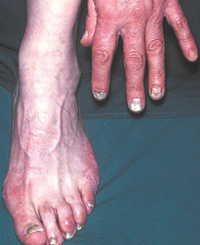 papules on the extremities and trunk. Content, with permission, from 2005 issue of Diabetes Wise by Dr Íomhar O' Sullivan 02/01/2006. Reviewed by Dr ÍOS 30/05/2005, 15/01/2007.Last review Dr ÍOS 4/12/18.